The Adams Center and Dahlberg Arena were constructed in 1953 to house the The University of Montana Grizzly and Lady Griz Basketball teams. In 1999, a fifteen million dollar renovation was completed which transformed the facility in size and service, broadening the spectrum of events possible. 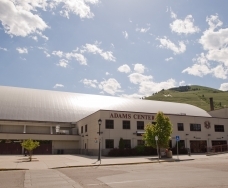 Today, the Adams Center, located at the corner of Van Buren and 6th Street East, is the superior choice in the Western Montana market for big concerts, trade shows, large-scale special events, and any kind of indoor athletic competition. The Adams Center is the largest event venue in western Montana with 7,500 seats in the arena (plus wheelchair space) and 14,200 square feet of space on the arena floor. Auxiliary space includes an 8,000 square foot room with a Sport Floor surface and a 9,000 square foot, hardwood floor gymnasium equipped with bleachers on four sides. All areas have full access to concessions and spacious public restrooms. For a touch of class, the Max & Betty Swanson Grizzly Sky Club, sitting above the Dahlberg Arena, is available for private meetings & social events. It sports a wet bar, private restrooms, and comfortable seating for up to 100 guests or "mixing room" for up to 200 at a cocktail party or reception-style event.